Hilma has launched an online configurator for customizing roller and ball bars at hilma-usa.com/die-lifter-configurator/. It simplifies the die lifter specification process and quickly provides a dimensioned drawing in imperial and metric units. 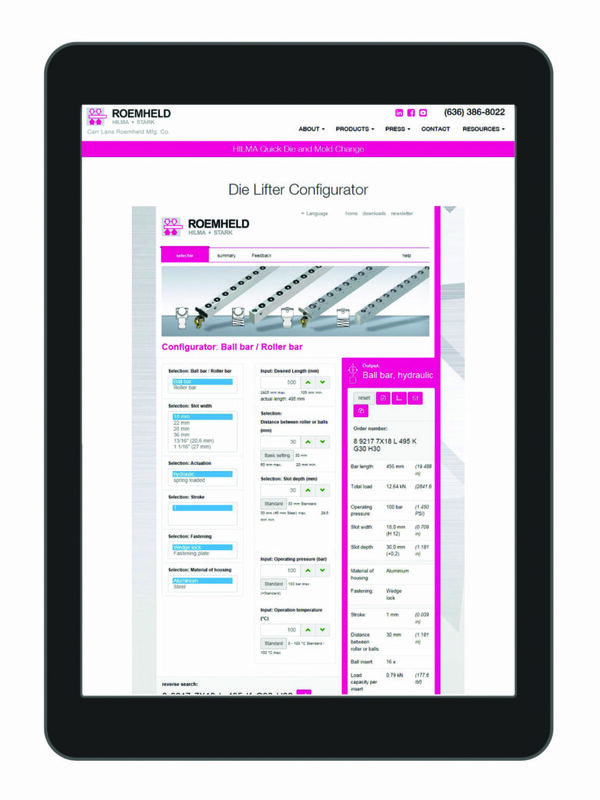 Optimized for use on Android and Apple smartphones and tablets, the configurator is available in 14 languages. Roller and ball bars allow for safe, ergonomic die movement during the die change process. The standard die lifters can be configured with rollers or balls, hydraulic or spring-loaded, in steel or aluminum, and in a variety of sizes to fit the user’s existing slots. Roller lifters have a maximum lift capacity of 8,600 lbs./ft. and are available up to 13 ft. long. Ball lifters can accommodate movement in any direction, while roller lifters can allow movement in one or two directions.